The good Doctor himself, Doctor Who has been through innumerable casting changes. Since the sci-fi series has been on the air since 1963, we've seen a revolving door of actors take the role of the Time Lord. While the development of a new Doctor is always one of the most followed casting announcements, there is another bit of casting news which helps rival this announcement. Namely, the incarnation of the Doctor's newest companion. That is exactly what happened today during the halftime show of the FA Cup semi-final match. Doctor Who's brand spankin' new companion is officially newcomer actress Pearl Mackie. While we don't know much about the companion's history and character development, we do know that Mackie's character's name is Bill. 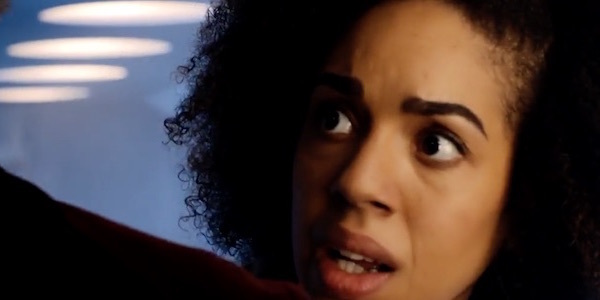 Altough we don't know much about actress Pearl Mackie or her character Bill, the excited newcomer did get to express her joy in joining the Doctor Who family in an official statement. Additionally, she very briefly described the character Bill, giving us a sneak peek as to what to expect from the newest of the Doctor's companions. The announcement also included a video, which was also posted on Doctor Who's official twitter account. Check it out below. While the above video is certainly exciting, it's safe to say that the footage isn't part of the upcoming season of Doctor Who. It's a bit early for any concrete footage to have been produced and edited into a trailer of this nature, unless the team is filming the upcoming Christmas Special. Still, it's unlikely that the above trailer has anything to do with a Christmas Special, particularly because it's not even official summer yet. Pearl Mackie will be replacing actress Jenna Coleman's tenure as Clara Oswald, the Doctor's most recent companion. Rumors of Jenna Coleman's departure had been circulating for months leading up to the official announcement. Coleman's tenure as the companion spanned from 2012 to 2015. While this may only be a few years in terms of traditional television, it is one of the longest stints of any of the Doctor's companions thus far- spanning 36 episodes. Additionally, she did assist both the eleventh and twelfth incarnations of the Doctor. Following the announcement of Clara's departure from Doctor Who speculation began regarding who would be the next companion to the Time Lord. Of course, rumors began floating around that the Doctor's companion would be a male. While men have assumed the role quite a few times during Doctor Who's very long run, their female counterparts tend to have longer tenures at the Doctor's side. What do you think of the upcoming character Bill? Pearl Mackie's description of the character certainly makes her seem like an interesting and captivating character to accompany the Time Lord on his adventures. Sound off in the comments section below! As always, we will continue to update you on all things Doctor Who as details become available to us.